To the north, El Salvador is still awaiting the decision of another secret tribunal in a case heard in September 2014. An Australian mining company, OceanaGold, sued El Salvador for $301 million because it was denied a permit to create a gold mine that would have poisoned the country’s biggest source of water. But that World Bank report was a feat of monumental hypocrisy, and not simply because it called for shifting of money toward “green capitalism” initiatives — in other words, the same runaway train that has brought the world to the brink of catastrophic global warming is supposed to now magically save the world. The World Bank has provided billions of dollars to finance new coal plants around the world in the recent years and repeatedly has provided capital to make possible dams and energy projects that have displaced large numbers of people and disrupted ecosystems. An Australian mining company insists its “right” to a guaranteed profit is superior to the right of El Salvador to clean drinking water — and an unappealable World Bank secret tribunal will decide if that is so. Drinking water is the underdog here. It might be thought that Salvadorans ought to have the right to decide on a question as fundamental as their source of water, but that is not so. It will be up to a secret tribunal controlled by corporate lawyers. And as an added bit of irony, the hearing began on El Salvador’s Independence Day, September 15. Formal independence, and actual independence, alas, are not the same thing. The case, officially known as Pac Rim Cayman LLC v. Republic of El Salvador, pits the Australian gold-mining company OceanaGold Corporation against the government of El Salvador. OceanaGold is asking for an award of $301 million because the Salvadoran government won’t give it a permit to open a gold mine that would poison a critical source of drinking water on which millions depend. So here we have an increasingly common scenario under “investor-state dispute mechanisms” — environmental laws designed to safeguard human and animal health are challenged as barriers to corporate profit. Not simply to recover an investment that didn’t pan out, but supposed future profits that a company claims it would have earned. Should El Salvador prevail, it would still have lost because it will spend large sums of money to defend this case, money that could have been used for the welfare of its people. An added insult in this case is that it is being heard not under one of the “free trade” agreements that elevate corporations to the level of (or above) a country, but under an El Salvador law passed by the former Right-wing government that has been since reversed. Pacific Rim originally sued El Salvador under the Central American Free Trade Agreement, but the case was dismissed because Canada, where Pacific Rim had been based before its acquisition by OceanaGold, is not a party to CAFTA. But the tribunal allowed the suit to be re-filed under an El Salvador law that granted corporations the same right to sue in secret tribunals ordinarily found only in “free trade” agreements. The tribunal judging El Salvador is known as the International Centre for the Settlement of Investor Disputes (ICSID) — an arm of the World Bank. Neither the public nor the press are allowed to witness ICSID hearings and there is no appeal to its decisions. Under the “investor-state dispute mechanism,” governments legally bind themselves to settle “disputes” with “investors” in the secret tribunals. Cases are decided by a panel of three judges selected from a roster. The judges are appointed to the roster by the national governments that have signed on to ICSID. Because ICSID, similar to other arbitration panels, does not have rules against conflicts of interest, most of the judges are corporate lawyers who specialize in representing corporations in these types of disputes. To provide just one example, one of New Zealand’s selected judges is David A.R. Williams, who is currently representing Philip Morris in its suit seeking to force Australia to overturn its tobacco regulations, which were ruled legal by Australia’s High Court. The three judges in this week’s hearing are V.V. Veeder of Britain, Brigitte Stern of France and Guido Santiago Tawil of Argentina. Mr. Veeder and Mr. Tawil are veteran corporate lawyers; the former has carefully omitted any mention of who his clients are in his CV, while the latter’s bio page boasts he has assisted in the privatization of Argentina’s assets while representing corporations in several industries. To put that in some perspective, an austerity program was imposed in the early 1990s in conjunction with selling off state enterprises at below-market prices. This fire sale yielded $23 billion, but the proceeds went to pay foreign debt mostly accumulated by the military dictatorship — after completing these sales, Argentina’s foreign debt had actually grown. The third member of the tribunal, Ms. Stern, is an academic regularly called on to arbitrate investor-state disputes. One of her previous rulings awarded Occidental Petroleum Corporation $2.3 billion against Ecuador because Ecuador had canceled an Occidental contract over a dispute in which the tribunal agreed that Ecuadoran law had been violated. The oil company was in the wrong but was given a windfall anyway! Among the precedents these three ICSID judges will consider are separate rulings ordering Canada to reverse bans on PCBs and on the gasoline additive MMT, both dangerous to human health, because the bans hurt corporate investments. The former Right-wing Arena government of El Salvador in 1999 passed a law enabling “investors” to sue the country in ICSID, thereby circumventing the local judiciary, as part of its effort to encourage foreign investment. A subsequent Right-wing government yielded to public pressure in 2008 by issuing the mining-permit moratorium, and the Farabundo Martí National Liberation Front (FMLN) administrations of Mauricio Funes (elected in 2009) and Salvador Sanchez Ceren (elected in 2014) have kept the moratorium in place. Local communities are shut out of arbitration forums like ICSID, but it is community organizing that is responsible for the, so far, successful pushback against environmentally destructive mining. The National Roundtable Against Metallic Mining, or “La Mesa,” is an organization of civil society groups that has led the opposition to OceanaGold. 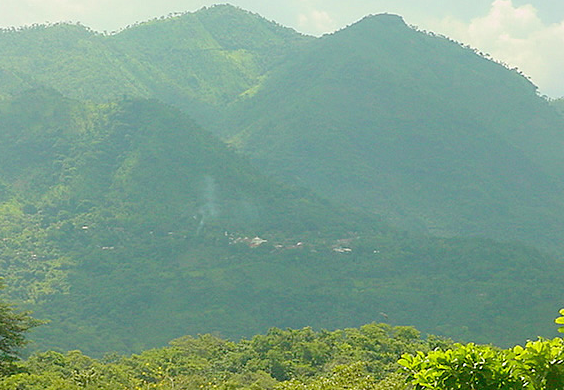 Several corporations have prospected in El Salvador’s inland highlands areas since the Right-wing Arena government passed the law allowing investors to sue in ICSID. A now closed mine in the area, on the San Sebastian River, operated by the U.S. company Commerce Group, left behind water too dangerous to touch, never mind drink. The El Salvador Ministry of the Environment and Natural Resources tested the river and found cyanide levels nine times above the maximum allowable limit and iron levels more than 1,000 times the maximum allowable limit. So polluted is the river that it runs yellow, orange or red at times. This history is not likely to be under consideration by the ICSID tribunal. It is not known when it will hand down a decision, although it is likely to be at least several months. Two fundamental questions that can’t be avoided are: Does a community have the right to make decisions on its own development? Do multi-national corporations have the right to a guaranteed profit without regard to the cost imposed on communities? That such questions must be asked — and that “no” to the first question and “yes” to the second are increasingly common answers — is emblematic of dictatorship, not democracy.